The final act of Babette's Feast is a quietly sumptuous celebration of the power of physical pleasures and the ways they can create meaningful human connections and profound expressions of faith. It's an inherently religious film, but one that has its mind more on earth than heaven. Though Gabriel Axel's direction is merely workmanlike throughout, the film's titular feast is a great cinematic moment. The rest of the film? Well, not so much. The first hour is little more than (pardon the pun) table-setting, told through flashbacks so top-heavy with voiceover narration, one feels at times like Karen Blixen's short story is being read verbatim. The set-up firmly establishes the ascetic nature of the small Danish Lutheran colony -- a necessary contrast to the earthly delights to come -- but less backstory, more luxuriating in long takes of devoted food preparation and rapturous dishes might have made Babette's Feast a sensuous masterpiece rather than the nice but often bland period drama it is. Martine (Birgitte Federspiel) and Filippa (Bodil Kjer) tend the small flock in their secluded 19th Century community, a job they took over from their minister father when he died years earlier. Simple women, they're devoted to their tiny, oft-discontented congregation, but flashbacks to 35 years prior reveal the lives they could've had instead. Brief hints at relationships with a misbehaving soldier and a French opera sensation were quashed before they could progress, the daughters' devotion unwaveringly directed toward their father. Even after the patriarch's death, a life of quiet routine consumes the pair until the arrival of the luminous Babette (Stéphane Audran), forced out of France due to political turmoil and sent to the sisters by the opera singer. She gladly labors as an unpaid housekeeper, and after years of service, when she comes into an unexpected windfall, she insists on cooking a traditional French meal to honor the late minister's 100th birthday. The dinner guests are all committed to their asceticism and decide to consume the meal as if it were the ordinary slop they normally eat, but the presence of an outsider -- Martine's onetime soldier love, Lorens (Jarl Kulle) -- who's astounded by Babette's menu of turtle soup and cailles en sarcophages and a host of fine wines slowly nudges them to embrace the carnal delights. Babette's Feast certainly saves the best for last, and while the lovely feast sequence can't retroactively generate interest in the staid, overly literary first hour, it makes for a rather enjoyable film nonetheless. 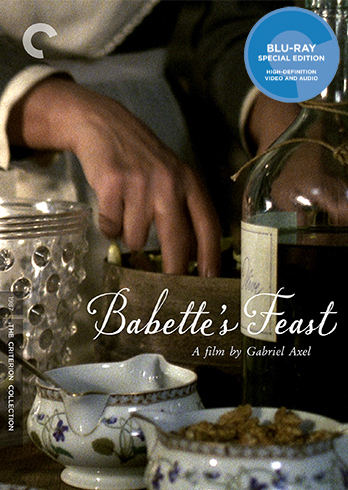 Babette's Feast is presented in 1080p high definition and a 1.66:1 aspect ratio. This is an exceptional transfer, easily the best the film has ever looked on home video. Clarity is sharp throughout, grain is evenly rendered across the image and fine detail is highly visible. The film's color scheme is pretty drab, but the images are still bright and crisp, and detail is strong even in lower-light scenes. The 2.0 DTS-HD Master Audio soundtrack is also excellent, with nicely immersive details in the surrounds and clean dialogue in the fronts. There's a good amount of material here, including new interviews with Axel and Audran, a 1995 documentary about Karen Blixen aka Isak Dinesen, a visual essay by Michael Almereyda on Blixen's life and the film's thematic concerns, a nice food-focused feature with sociologist Priscilla Parkhurst Ferguson on French cuisine and the film's theatrical trailer. The package also includes a booklet with an essay by scholar Mark Le Fanu and the complete text of the original short story. Even for someone less than overjoyed by the film, this is a fantastic package. Fans should be in heaven.